As part of the new logo revealing and announcing other changes at the Freshman Convocation, Jones College President Dr. Jesse Smith dons a T-shirt with the new logo for the college. As part of the revealing of the new Jones College logo and rebranding at the Freshman Convocation, faculty disrobed to show the new logo on their T-shirts. There is nothing “junior” about the college in Ellisville, the president of the newly named Jones College said on Friday. Dr. Jesse Smith, during the freshman convocation, announced that the Ellisville two-year college will now be known as Jones College, or JC for short. Legally and officially, the name will not change and the athletic teams will still be known as the Jones College Bobcats. The announcement drew rave reviews from freshmen gathered at the event, which also included a speech by internationally known speaker and author Andy Andrews. 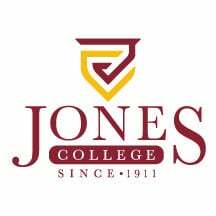 Faculty, staff and administrators “revealed” the new image and logo and the future of Jones College they have been researching for a decade. Waynesboro freshman Layne Boykin said the new image and name sets Jones College apart from other junior and community colleges. Andrews helped prepare a pathway of success for Jones College’s more than 1,800 freshman to follow if they should choose to do so. After falling on hard times at age 19, Andrews began to understand the importance of every decision. He shared with the freshmen class and college representatives, our choices and how we think about our circumstances can determine how successful our journey in life can be. “If we choose how we think, who we listen to, who we hang out with and what we do not watch or who we do not hang around, and do not listen to, we choose our pathway.We are in control and we can have hope for the future. Our choices determine our destiny but it is how you think about what happens to you that can lead you to happiness,” said Andrews. All Jones College freshman received Andrew’s book “The Traveler” as part of a required course on personal development. Boykin said she agrees with Andrews about the importance of choosing our pathway. She also points out that some have an easier route because of circumstantial advantages. Jones College officials are hopeful the community will also embrace the new future of the two-year institution. As Andrews shared with the freshman class, everyone can make a difference if we change how we perceive the new opportunities with the challenges of our future.